Here is Tylie as Ladybug Look. She is my least favorite of the Garden Party La Dee Da dolls. 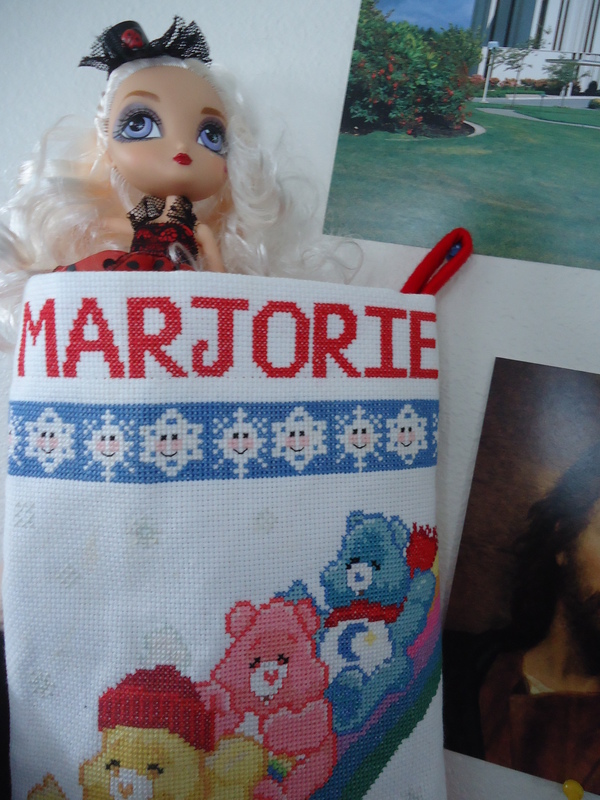 She’s hanging out in my Christmas stocking. 4 more days ’til Christmas! And just a few days left of Dolly A-Z! Here is the ringleader of the La Dee Da crew: Dee! 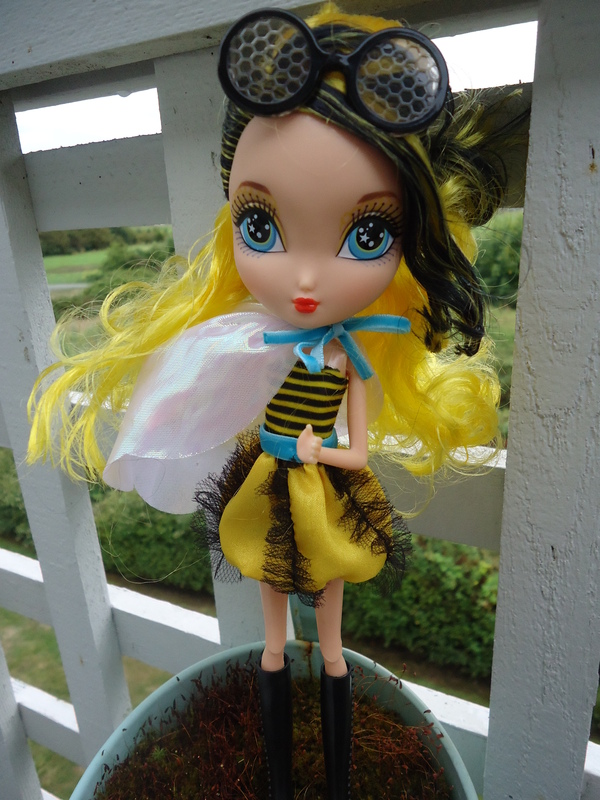 Specifically, Dee as Bee. I took her out to my deck to mingle with actual bees, but it was a little chilly the day I took the photo, so thankfully for me, no (real) bees. I’m going to London today! I’m gonna let you in on a secret–I’m actually writing these posts several days ahead of time, so I’m still a few days away from my trip in real life, but it’s fun to pretend that today is the day. I’m also gonna knock out a few more dolly a-z posts before I go, so we don’t miss a day while I’m gone. Meet Cyanne, from La Dee Da. 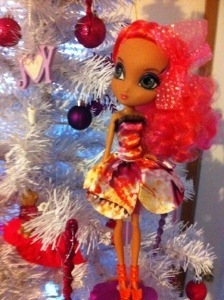 I was attracted to La Dee Da with their look of a poor man’s Pullip (big eyes, big head, skinny bodies). I brought them home one day after I went to Walmart with a fat wallet. I had wanted all four girls for a while (Dee, Cyanne, Sloane and Tylie), and my store finally had all four garden party girls at the same time. I was also considering the candy collection. Since I’ve bought them they have released a fruity collection (a little boring, but less expensive) and a princess collection, which is pretty cute, if a bit of a ripoff of Ever After High. I’m happy with my choice to bring these girls home, but I feel no need to bring more La Dee Da girls home. I just don’t want more little dolls. I’ll stick with the bigger play dolls; support my addiction to American Girl. 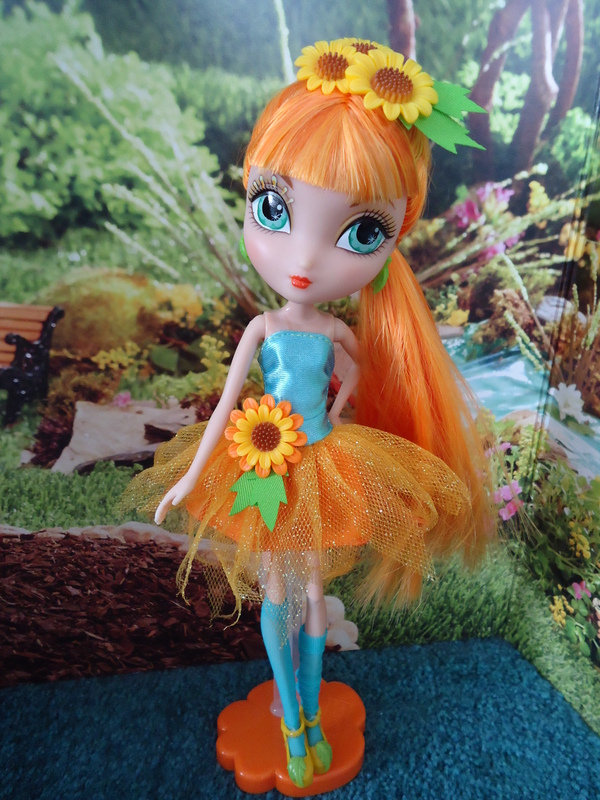 Today we meet Cyanne as Sunflower Burst. My love for Cyanne is all about color. Orange with turquoise is brilliant! I think that her hair is the most delicious color in existence. This is the last chapter of spending my bonus (not that I spent all of my bonus, but I’m done spending it on dolls–I hope). This is the last thing I paid for, but the first thing that arrived, because I bought them at Walmart. I’ve been eyeing La Dee Da for a while because I think they’re adorable, but I just don’t think my collection wants to go in the Barbie/Monster High/other fashion doll direction. These girls kinda remind me of Pullip. Aren’t they fun? It’s been a crazy dolly day. 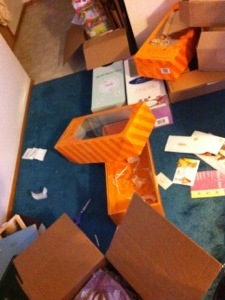 Check out my photo below of the dolly box carnage!